It’s time to say goodbye to one of my favorite YA series, but not without Ms. Caine taking us for a final thrilling, riveting, and dramatic ride throughout that dark and dangerous place that is, Morganville. The gang is back in town, and what’s under Morganville’s new atmosphere of peace and bright colors is proving to be more sinister and dangerous than the vampires themselves. The final battle between our friends and the Daylighters (an organization of humans formed to get rid, or in their leader’s words, “Rehabilitation of vampires”) takes center stage, and again it’s proven that power in the hands of the wrong being is evil regardless if they are human or not. I loved how Ms. Caine has managed to grab my attention from page one of each installment, and hardly gives me time to take a breath until the very end, and Daylighters is not the exception, although it’s not my favorite in the series, the drama of “who will survive this final chapter” was enough to keep me on the edge of my seat. I loved how realistically the author fleshed out these characters. I feel as if this were a group of dear friends, and every time I picked up a book was like visiting old pals, some I adored to the very end, Myrnin my favorite. Claire, a valiant young girl, easy to root for. Her friend’s Michael and Eve, the perfect complement to the group. Shane…. Oh Shane! Claire’s love interest, and until the very end my most problematic character. Sometimes I liked him, but most of the time I just tolerated him, and that’s proof of how well developed and multidimensional these characters have been. Don’t shoot me! I’ve always thought that Claire was too good for Shane. If you have not had the chance to meet this awesome cast of characters, I highly recommend starting with Glass Houses (first book in the series). It won’t leave you disappointed, and you’ll gain a group of friends that will keep you on the edge of your seat throughout their peril. If you are and old time fan, I think you will be pleased with the way Rachel Caine brings it all to a conclusion; the action, the drama and the exhilarating pace of the story deliver a perfect closing. 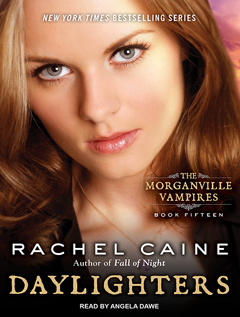 I like to thank Rachel Caine for all the years of fabulous entertainment, and for delivering a cohesive and most satisfying ending to the Morganville Vampire series. First I have to say that Angela Dawe is one of my favorite narrators, I’ve have always enjoyed all of her performances; unfortunately, there’s something to be said about switching narrators in midstream when it comes to an audiobook series, in very few occasions this is viewed as an improvement, most of the time it’s met with anger and disappointment from the long time listeners, and most of the time it is the narrator that is hold responsible, sometimes dismissing the quality of their performance. I can’t say that I was angry, but I was definitely disappointed. I didn’t listen to the previous 3 novels in the series. I just couldn’t adjust to the new interpretation of the characters, the pronunciations, and the overall feeling I got from the story. I thought I had let enough time pass, so I decided to try Angela’s Dawe’s performance of Daylighters audiobook; unfortunately Cynthia Holloway’s voice (narrator of the first 12 novels in the series) was cemented in my head, and I felt as if I were listening to a different series, and even Ms. Caine’s quality of writing didn’t have the same power; all in all, not even closely as enjoyable. Like I said before, Angela Dawe is a very competent narrator, and maybe if you never listened to the first 12 books in the series, and you only have Ms. Dawe’s interpretation you might really enjoy the audiobook. The writing, the twist and turns, and the fast tempo of the stories are definitely engaging enough to provide a good listening experience, but if you are a long time listener I’d recommend just reading it. I like both narrators but I would have a super hard time getting Cynthia’s voice out of my head to let Angela in. I read the last few just for that reason. I just couldn’t do it! I used to like this series, but for some reason I stop reading after book ninth. Grr … I’ve had the 1st book of this series for so damn long but haven’t read it. I listened to part of that sample, and I wasn’t feeling the narrator. So I’ll definitely be sticking with the book.